Mercedes A-Class (2012-2018) - Car Reliability Index | Reliability Index | How reliable is your car? When Mercedes launched its original A-Class in 1998 it came up with something new and unique. Here was a small family hatch with an elevated position for its seats thanks to a 'twin-floor' construction that put all of the car's mechanicals underneath the occupants in the event of a crash. When the second-generation A-Class arrived in 2005 it used the same formula, but the costly construction meant sales were still hard to come by. As a result, Mercedes went for a more conventional design with its Mk3 A-Class, launched in 2012. It may be less distinctive, but the third take on the A-Class was far more mainstream, with the car proving to be a much bigger seller. If you want something that&s fun to drive you're likely to be disappointed as even the A45 AMG isn't as dynamically capable as it should be, even if it's blisteringly quick. 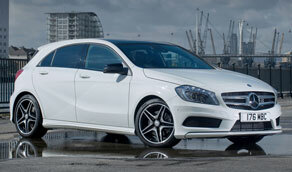 But the Mercedes A-Class is safe, stylish and easy to live with and for most buyers that's more than enough. 12/12 The third-generation A-Class hits UK roads with a choice of A180 (122bhp, 1,595cc), A200 (156bhp, 1,595cc) or A250 (211bhp, 1,991cc) petrol engines alongside A180 CDi (109bhp, 1,461cc or 109bhp, 1,796cc in auto form) and A200 CDi (136bhp, 1,796cc) diesels. 08/13 The 360bhp A45 AMG reaches showrooms; it's fitted with the world&s most powerful four-cylinder engine. 01/14 The A180 CDi Eco SE has CO2 emissions of just 92g/km. At the same time, the A250 4Matic arrives, with 4WD. 09/15 A facelift brings new colours and materials, an A220d 4Matic option, an adjustable chassis (called Drive Select) and an A180d option with CO2 emissions of just 89g/km. Buy an A180 CDi and it gets a 1,461cc engine with a manual gearbox, but a 1,796cc engine with an auto box. The automatic gearbox is a seven-speed dual-clutch item. The A250 and A45 AMG are available only as autos. The 2015 brought extra power for most A-Class variants; in the case of the A45 AMG it was boosted to 381bhp. The seatbelt height adjusters, built into the A-pillars, have a tendency to rattle loudly on earlier cars; later cars got a redesigned mechanism. Some owners have also complained of rattles, creaks and squeaks emanating from various sections of the dashboard, mainly the centre. Some A-Classes have run-flat tyres and some have conventional rubber. If swapping from one type to the other be sure to tell your insurer. If you buy an A-Class without navigation you can buy an SD card for £200-£400 and slot it in. You need to buy the right card for the car though.